Last year for a dinner party I served Dorie’s honey spiced madeleines with poached pears and loved them. This time I wanted to try something a little different and decided to add Scharffen Berger bittersweet baking chunks to my cookies. I have to admit that after I topped the madeleine dough with the chocolate I wondered if the cookies would rise under the weight of the chunks. Success! After spending the night in the fridge the oven heated dough pushed up forming a golden cookie dome under the chocolate chunks. Don’t you love it when cookie experiments, especially the ones that involve bittersweet chocolate turn out? Madeleines are more like little cakes than cookies and I love that one recipe makes 12 servings which fit nicely in a large madeleine mold. One of these cookies with a cup of tea in the afternoon or with fruit or ice cream after dinner is just the right amount to satisfy a sweet tooth. Cookies or a delicious science experiment? I baked these in a convection oven that sits above my counter where it’s easy to see the madeleines rising out of the pan, this is the oven I use for baking during the Summer when it’s hot outside, it’s small but works exceptionally well for a small batch of cookies. I also have a large gas fueled oven that can heat the entire house in the Winter if the heater goes out so I don’t like to turn it on when it’s hot to make 12 cookies even if they are like little cakes. Last week I decided to give away a cookbook to one of my followers who left comments on both my smoked trout salad and apple spelt pound cake. I assigned everyone a number and let my husband Scott select the winner. As luck would have it Aimee from Clever Muffinwon La Calabria, a lovely cookbook featuring rustic southern Italian cooking. 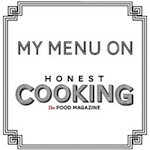 Thanks to everybody who left comments and I plan on giving away another cookbook or two in the coming months. The recipe for these honey spiced madeleines is in Around My French Table by Dorie Greenspan and as we have been asked not to share the recipe I would encourage everyone to pick up a copy of the cookbook and cook along with the group. 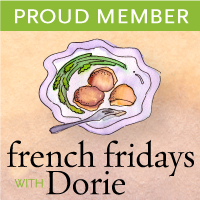 Please check out all the participants in this online cooking group here on French Fridays with Dorie. Please let me know if you like the idea of the chocolate chunks baked into the madeleines? I can tell you the chocolate tasted wonderful with the honey, orange and spice flavors in these cookies. Oh Patty – one of my favorite cookies – madeleines! Never thought to add chocolate chunks – brilliant! Hope you are having a good week and have some fun plans for the weekend. The weather should be good!!! How cute, I really like your addition of chocolate chunks. They look delicious! Ohmygoodness–those are knockouts! I especially love your last photo with the madeleine nested in the chocolate chunks in the leaf bowl. Happy fall, Patty! Oh lady! You are a showoff! These look tasty indeed! And look how perfectly filled they are! Did you chill them in the pans? I have never made madeleines before. I am starting to love this book. Lovely pics. Patty, These look absolutely gorgeous! Love the idea of the chunks of chocolate on top. Have a great weekend! The addition of dark chocolate is an inspired choice! And your china is gorgeous! Great photos, as always! Have a wonderful weekend! Chocolate makes everything better. These look great!! Love the dark chocolate chunks! Yum! I'll take the last one Love Scharffen Berger dark chocolate chunks straight up! Love gazing at your beautiful photos, Patty. Have a great weekend! Oooooh, lovely- I think I could warm to madeleines with chocolate in them. I'm sure the cookbook will be enjoyed. I could eat a couple of these or the whole pan at the moment, it's been that kind of week. Hoping for a turnaround next week. Hope you have a great weekend too. I love your plates and how your humps pushed past the chunks! I knew you would have found a way to make these more appealing…I just didn't have the energy this week! Oh, I know I would love these with chocolate. What a great idea, Patty! Those look amazing – I think the poached pear idea would be great, too. Your creativity is always inspiring. Oh, now I need to go find my stash of chocolate…just seeing your photos makes some good chocolate chunks irresistible…this is how I will made madeleines next time. They look so pretty! Love the chocolate topping. Wishing chocolate didn't give me a migraine – would love to taste your madeleines. Loved the idea of pairing them with pears too. Patty-I love the way you added the chocolate chunks to the madeleines. They look so pretty, and so invitingly yummy! I do love the chocolate addition! Hubby loves chocolate and orange together. I think I need a madeleine pan. Cookies and a science experiment! Two of my favourite things!! These look so sweet, and really would go perfectly with my afternoon cup of tea. And thanks again for the cook book! Madeleines are very dear to my heart and are accompanied by fond memories. I will be eventually telling that tale also at another time. For now, I can tell you that as much as I love chocolate pretty much in any baked treat…I want to be sincere in saying that I'm not too fond about the madeleine losing her wonderful curves with the distraction of chunky chocolate…sigh. Nonetheless…I certainly would never refuse these mini-cakes nor chocolate…so there it is in one neat package. I hope there is one or two more of these madeleines left for me. It looks divine with those chocolate chunks! They look so pretty and score on the bitter sweet chocolate chuck! Lovely little things aren't they, madeleines? They look exquisitely delicious and chocolatey. Yum yum yum. I think you just inspired me to make some this weekend for a beauty sale that my friend is hosting. O for heavens sake, I believe you have just invented the worlds greatest mandeleine! These are perfectly wonderful! Congratulations to you! Because my cookie experiments NEVER turn out. That is why cookies are my nemesis. Really lovely!! These cookies look so cute and scrumptious, Patty. Very smart to use your mini oven for these. Summer is already too hot as it is so why bake ourselves in our homes while we're supposed to be baking cookies? Teehee. Oh, and I'm lucky if any of my cookie experiments turn out. Haha. Great photos as always, my dear! Congratulations to Aimee! These look so delicious. I really need to make them but I'll have to go shopping for the pan first, have always wanted to make Madeleines and this would be the place to start! Wow.. these look heavenly… I love madeleines and chocolate… so these are perfect!